Lead quality is always a hot topic here at GigMasters. As it should be! Leads are the most important factor in getting gigs. As you may know, there are four membership levels and each one has a different maximum Travel Distance. But did you know that you can customize your mileage? GigMasters calculates the distance to the event location “as the crow flies.” This allows you to receive more leads within your membership level. For example, 100 miles in straight line covers a lot more territory than 100 miles of windy roads. After you get a gig alert, we always recommend that you map the location to get the exact mileage and travel time estimate. Having a wide radius will give you more exposure nationwide, but you may want to consider setting a more realistic range that fits your business. If you're more of an "everyday" local vendor, for example, then you may be better off keeping your Travel Distance under 200 miles. Some vendors in big cities get really aggressive and have their distance set below 50 miles. Scoring a gig close to home is sweet! However, in the event industry, you know traveling is part of the job. If you’re a wedding band that only does a dozen gigs a year, you probably want a larger radius. And road warriors, such as comedians and speakers, are more used to getting corporate gigs in far away places. To expand your gig horizons, set a higher Travel Distance. Note: These are just examples - you’ll need to experiment with this on your own. 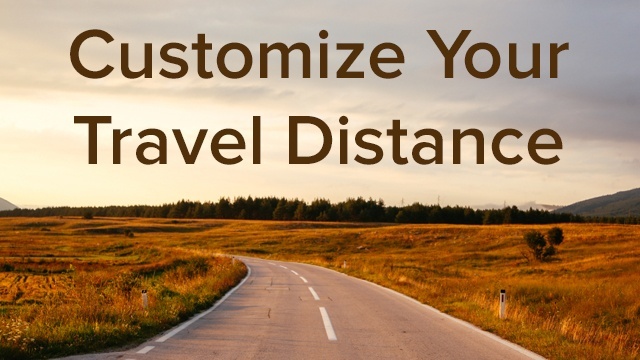 If you're getting leads where the pay isn’t worth the trip, you should try a shorter distance. Your Travel Radius settings are in your Control Panel under your Profile tab (remember to save at the bottom). View the complete list of GigMasters Membership Benefits and Features - click COMPARE here. Creating multiple profiles in different locations is a common strategy by many of our top members. If you’re in a populated area, you could set a short radius set on one profile and create another page for catching out of town gigs. You can always create an additional membership (50% off) right from your Control Panel's Dashboard. OK, that’s a lot of info to absorb. If you have any questions, please contact info@gigmasters.com any time. Have a safe trip!